The search for better cancer treatments and cures is a step closer with the opening of the Victorian Comprehensive Cancer Centre (VCCC), a purpose-built centre-of-excellence for cancer research, treatment, education and care located in Melbourne’s prestigious Parkville Biomedical Precinct. 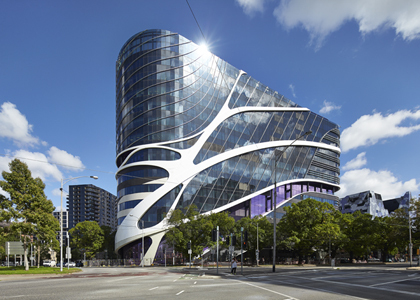 The $1 billion, 130,000-square-metre centre is home to cancer research, clinical services and educational facilities for Peter MacCallum Cancer Centre, Melbourne Health and the University of Melbourne. Delivered under a public-private partnership, the Victorian Government contracted the Plenary Health consortium comprising Plenary Group, the Grocon / PCL builder joint venture and facilities manager Honeywell to design, build, finance and maintain the project under a 25-year concession. After more than four years of construction the VCCC opened to staff and patients on time and on budget in June 2016. Anthony Lamaro said Fantech supplied over 470 fans including several 1800mm and 1600mm diameter supply air fans. He said almost half of the fans in the benchmark project were smoke spill, ranging in diameter from 400mm to 800mm plus a number of large 1250mm diameter roof units. Speed control correction data was supplied for each of the fans through Fantech’s Fan Selection Program providing vital information on how the fan will perform at lower speeds to reduce noise and energy consumption. Air Design Air Handling Units were chosen for their quality and reliability and used throughout the whole facility for both clinical and research spaces including operating theatres and PC3 suites. Over 480 units were supplied which comprised MODUtherm and SM Series units of various configurations. Bob said as the VCCC was a clinical, research and educational facility a huge volume of specialist filters from Airepure Australia was required for the ventilation systems in the animal house, PC2/3 laboratories, isolation rooms and operating theatres. These included: bag-in bag-out units, six Focus 2000 laminar flow units for the operating theatres, and more than 500 terminal HEPA units. He said the job was challenging, but thanks to the collaboration of companies within the Elta Group, the HVAC component ran smoothly and was completed in time for the VCCC’s completion in June.